Intel has officially launched the next wave of Optane SSDs, continuing a gradual rollout of higher density drives as their production of 3D XPoint memory catches up with demand. Intel's flagship consumer SSD family is still split between the Optane SSD 900P and 905P, with the more recent 905P filling out the higher capacities while bringing modestly improved performance and power efficiency. This week's releases are the 1.5TB 905P add-in card and 960GB and 1.5TB 905P U.2 drives, bringing the consumer lineup and the enterprise P4800X line both up to the same maximum capacity. The larger capacity options don't bring any more performance improvements because they are still using the same controller, and even the smallest 280GB 900P had enough 3D XPoint dies to keep every channel of the controller busy. The bigger drives do have higher power consumption, with the 1.5TB 905P add-in card rated for up to 17.7 W for write operations. We have probably reached the end of the line for capacity increases while Intel is still using first-generation 3D XPoint memory for their consumer Optane products, because Intel is still charging well over $1/GB and that means even the 1.5TB 905P will cost more than a well-equipped gaming PC. However, interesting things are happening at the lower capacities. Newly launched products in bold, unreleased products in italics. The M.2 version of the Optane 905P that was previewed at Computex is getting closer to release, and the specifications are now shown on the 905P product page (though not yet on ark.intel.com). The 1.5TB U.2 drives are the first products to use BGA packages of eight 3D XPoint dies, for a capacity of 128GB per package. Those same packages could potentially be used to deliver a 750GB M.2 version of the 905P. However, power consumption is getting to be a problem with the 380GB M.2 rated for 11.7W during write operations. M.2 connectors are typically rated to carry only 4.5A across all the 3.3V supply pins, for a limit of 14.85 W. A 750GB M.2 would likely need some throttling or other power saving measures in order to reliably operate within that limit, and even the 380GB drive will likely stress the current delivery capacity of some M.2 slots. On the enterprise side of things, the P4801X M.2 drive has still not officially launched, but ark.intel.com is listing a 100GB P4801X U.2 drive. The capacity is similar to the Optane SSD 800P's 118GB limit, but the P4801X is still using the full seven-channel controller with a PCIe x4 host interface so performance is far higher. The 100GB P4801X isn't as fast as the larger P4800X and 900P/905P drives—write speeds in particular have suffered with a mere 1GB/s sequential write and 250k random write IOPS. But the latency ratings for this small Optane drive are still just as fast, and the active power rating of 7W is quite reasonable for a M.2 drive. Intel's announcement this week has been accompanied by fresh roadmap leaks from a slide deck intended for an event in November. The file was found on Intel's Russian website and appears to be authentic, but the information in it is still subject to change. 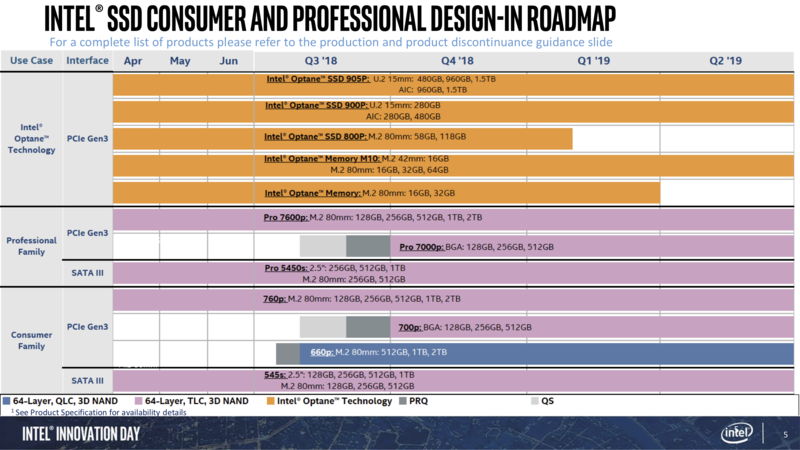 The leaked roadmap shows the original Optane Memory M.2 and the Optane SSD 800P being discontinued in early 2019, though the Optane M10 M.2 cache module will remain through at least the middle of next year. A discontinuation of the 800P would clear the way for a consumer counterpart to the smaller P4801X, in M.2 form factor. Intel might not want to put such a product in their 905P product line, but capacities in the 100-200GB range would be a very welcome performance boost over the 800P while still remaining somewhat affordable. However, this still wouldn't give Intel a high-performance Optane M.2 SSD for the mainstream consumer market because the current 905P and P4801X M.2 hardware is a 110mm-long double-sided M.2 card that can't physically fit in laptops and would also be incompatible with some desktops.